Learning with voice, Letters and words, vehicle, Fruits and vegetables, animals, color and shape, articles for daily, zoo, count and calculate, learning the shapes, drawing, learn ablution, learn prayer steps, learn Quran and Douaa. Digital Quran Pen with high quality speaker with full Quran recitations by 9 audio recitations, 4 audio translations, Noorani Qaidah learning and 3 other booklets. Everything comes in a beautiful metal carrying case as shown (with hardboard backing). Beautiful 2 piece raihal which attaches to become a very sturdy book stand. Each raihal has a beautifully carved design with Name of "Allh and Muhammad" in Arabic on both inner plates. The pieces are machine made of MDF type wood material. 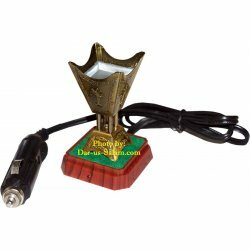 Size: 11x15x0.17"
Make your vehicle smell nice with the use of your favorite incense and this easy-to-use incense/bakhoor burner. You can remove the sticky tape and place it on your dashboard to beautify your car as well. 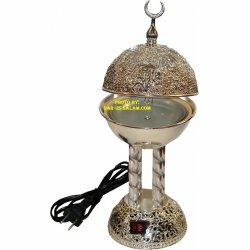 Beautiful decorative metal incense/bakhoor burner. Just plug it into 110v socket (US plug) and it will heat up the plate under the incense without the need for any charcoal. Ideal for Masajid, home or office. 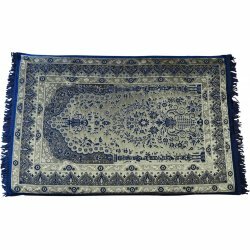 The Innovative Prayer Rug from Sundus is a comfortable prayer mat that features high quality layers of Memory foam that provide the best ergonomic and anti-fatigue results during prayer. Beautiful package of following 6 items: Tasbeeh with 33 beads, netting Prayer Cap, Nail cutter, Qibla compass, finger tally counter, and fold-able Prayer Rug. 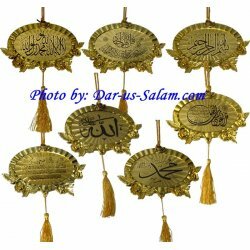 Beautiful golden color oval design hanging decoration with assorted designs. Decoration is made of plastic with thread on top to hang with and tassel on the bottom. Decoration set comes in clear plastic envelope. 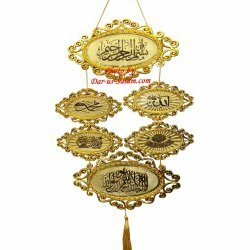 Beautiful large size golden color hanging decoration set with 6 sections. Each plate is plastic with different calligraphy on each. All plates are hooked up via small rope with place to hang on top and tassel on the bottom. Beautiful medium size gold/silver color Quran gift box/case with matching stand. The box has an elegant gold/silver, blue & maroon design with Al-Quran written in the center. Excellent to protect the Quran and beautify your home/office/Masjid/Islamic school or to give it as wedding gift or on any other occasion. Beautiful large size golden color Quran gift box/case with matching stand. The box has an elegant gold & white design with Al-Quran written in the center. The inside of the box is covered with nice velvet maroon color cloth while the bottom has a black velvet cloth. 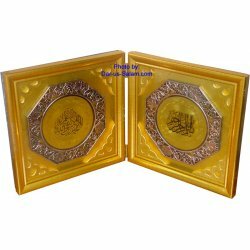 Beautiful large size golden color metal Quran gift box/case with matching metal stand. 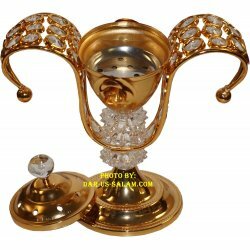 The gold color metal box has an elegant design with beautiful stones as pictured. The box & stand are made of metal which means they are more durable and thus heavier in weight.